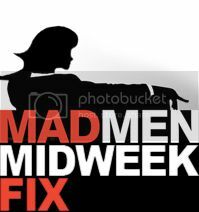 Here we go with this week’s take on the latest Mad Men from the Feministing crew. Let’s jump in and get discussing. As always, tons of spoilers follow. The scene between Peggy and Megan in the bathroom showed me how intensely they both try to appease Don. They both kept referring to “him,” both knowing who they were talking about. I was wondering how much the show paid for the song, since I’ve never heard The Beatles on TV except in clips from Ed Sullivan. Apparently, $250,000. Matt Weiner keeps downplaying the role of money in the behind-the-scenes operation of the show, which I find kind of odd, since class privilege clearly plays a role in the particular ways Mad Men’s characters are depressed as hell (seriously, this is a show about some very moody rich people).